High Quality Content by WIKIPEDIA articles! High Quality Content by WIKIPEDIA articles! 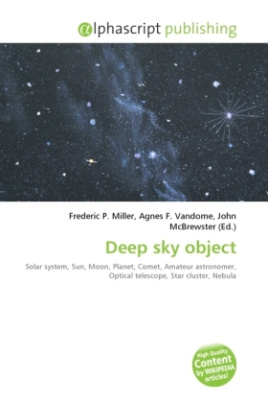 Deep-sky objects are astronomical objects other than individual c. The classification is used for the most part by amateur astronomers to denote visually observed faint naked eye and telescopic objects such as star clusters, nebulae and galaxies. Classifying non-stellar astronomical objects began soon after the invention of the telescope. One of the earliest comprehensive list was Charles Messier's 1774 Messier catalog, which included 103 "nebulae" and other faint fuzzy objects he considered a nuisance since they could be mistaken for comets, the objects he was actually searching for. As telescopes improved these faint nebulae would be broken into more descriptive scientific classifications such as interstellar clouds, star clusters, and galaxies. "Deep-sky object", as an astronomical classification for these objects has its origins in the modern field of amateur astronomy.